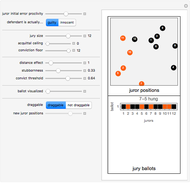 In this spatial and dynamic model of jury behavior, jurors initially vote to convict or acquit the defendant based on a random variable drawn from a distribution affected by: (1) the defendant's actual guilt or innocence, and (2) the location of each juror in a two-dimensional conceptual space that represents the juror's ability to accurately perceive the situation as well as his or her predilection towards conviction. On subsequent ballots (the second stage), the jurors revise their votes based on the weighted votes of the other jurors. The weights for each juror are determined by a distance measure between that juror and the other jurors and a "stubbornness factor" that gives a special weight to the juror's own prior vote. The balloting continues until a fixed point is reached or until ten ballots have been taken, at which point the jury is assumed to have reached exhaustion. You can control both the initial location of the jurors within the space and various parameters that affect the dynamics of voting. The jurors displayed in the top graphic are locators that you can drag, provided the "draggable" control is set appropriately. Moving the jurors about alters the weights they place on the votes of their fellow jurors and may alter—sometimes quite dramatically—the evolution of balloting. Alternatively, you can reset the entire jury pool to random new positions by moving the "new juror positions" control. You can also potentially affect the final result by changing the laws relating to jury size, the minimum number of guilty votes needed to convict (conviction floor), and the maximum number of guilty votes consistent with acquittal (acquittal ceiling). 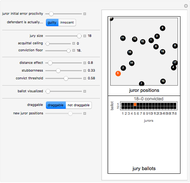 Finally, you can also alter the dynamics of "persuasion" by changing the effect of distance on voting weights (distance effect), the relative weight the juror places on his or her own prior vote (stubbornness), and the weighted fraction of votes needed to convict before a juror will vote to convict on the next iteration (convict threshold). The top graphic of the output shows the positions and votes of the jurors. Black is guilty and orange is innocent. 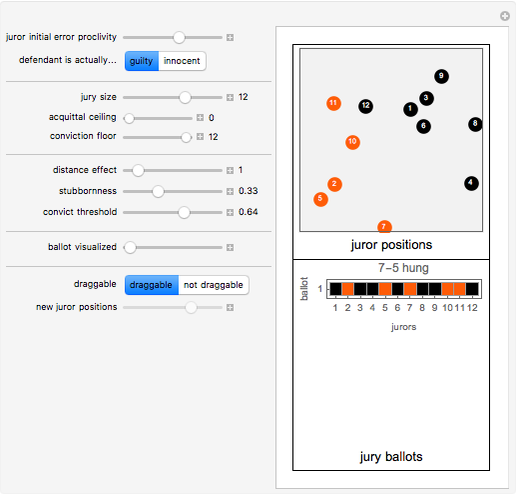 The bottom graphic of the output shows a chronology of the ballots taken by the jury. 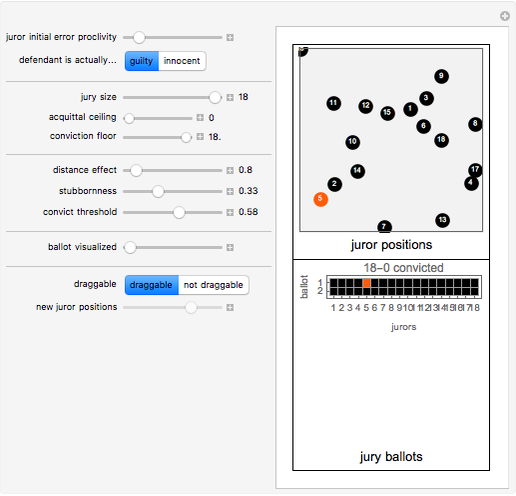 The control labeled "ballot visualized" provides an alternative visualization of jury dynamics by letting you select the ballot with which the top graphic is associated. Experiments done with this Demonstration suggest that the systems generally either rapidly reach a fixed point or go through very short cycles. Even with systems of size 18, complex behavior was not observed. The system described by this model appears quite sensitive to the "weighted votes needed to convict" parameter. Even small changes in this parameter can tip the model and cause a cascade leading to a different final result. 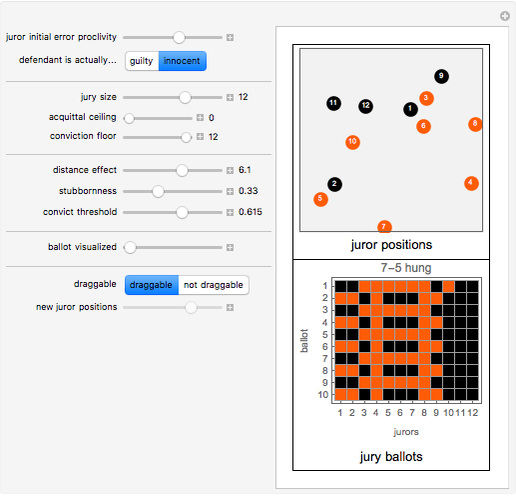 One experiment permitted by this model would be to determine the probability that guilty defendants are acquitted or that innocent defendants are convicted as functions of: (1) legal rules relating to the size of the jury pool, the number of guilty votes needed to convict, and the number of guilty votes that prevent acquittal; and (2) factors that the judicial system might affect, such as the homogeneity of jury pools and the degree of deference jurors should pay to the votes of their colleagues. A spatial dynamic jury model is featured in the "Guilt Trip" episode of the CBS television drama Numb3rs. Seth J. Chandler "A Spatial Dynamic Jury Model"